Ashley Villareal, a student volunteer, helps by filling the tacos with beans. The taco line was made up of tortillas filled with refried beans. Campus Activities members made sure all the tortillas touched one another to create the record-breaking line. The previous taco line distance was 654 feet, five inches, and set by Emory University in Georgia in 2012. 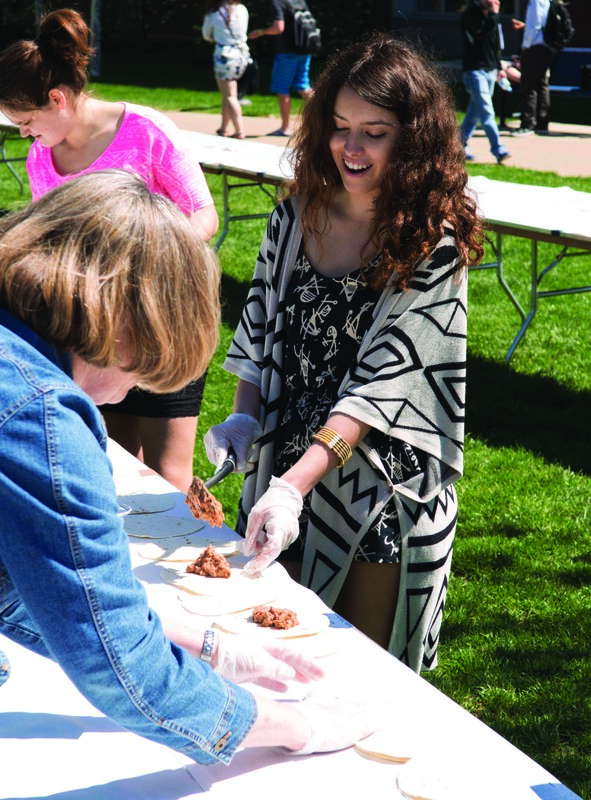 But Tuesday at Webster, the crowd cheered as Kristen McDowell, student supervisor, announced the university’s taco line measured 851 feet — breaking even the record they had set for themselves. “We were shooting for 700 feet of tacos,” said Chef Jonathan Kraft, from Sodexo Corporation. Faculty, coaches, students and staff joined the taco line, filling and placing the tortillas down the tables. “We couldn’t have done it without the help of all these volunteers,” said Bill Boxdorfer, graduate assistant at Campus Activities. Sodexo and Campus Activities hosted the event. This is the second world record-breaking food event held at Webster. Two years ago, Webster set the world record for the longest ice cream sundae at a little more than 200 feet. At the end of the event, the portions and toppings that were not consumed were given to St. Patrick Center, one of Missouri’s largest charity organizations for the homeless.